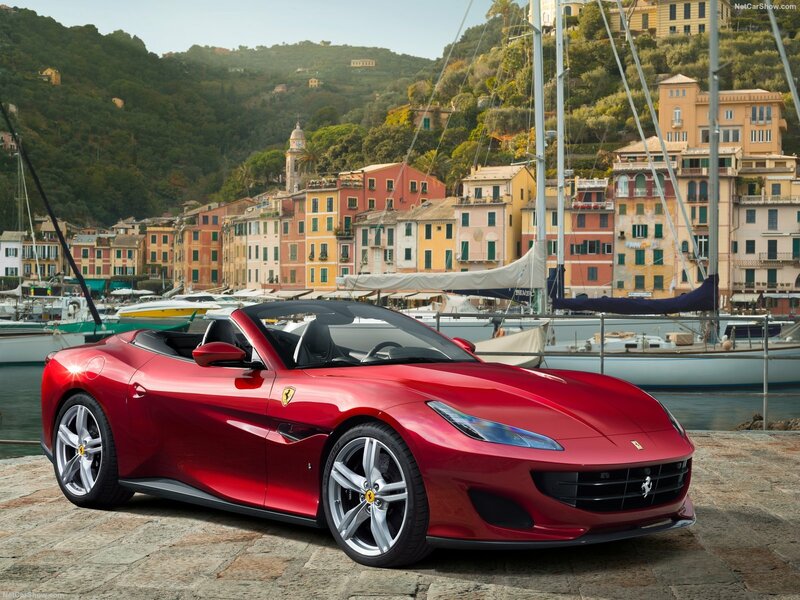 The team of Rental Car Company allows you to move exclusively in the new Ferrari Portofino, great successor of the Ferrari California T.
This elegant Ferrari Portofino that we offer for rent is very remarkable. This large cabriolet coupe retains a high-class hardtop with a brand new bodywork to make it lighter and more luxurious. The roof can now be handled by rolling unlike older generations, it is an improvement in comfort that will allow you to sunbath the most luxurious it is at the edge of the Mediterranean Sea, along the Croisette in Cannes or the Promenade des Anglais in Nice during your holidays on the French Riviera. This grand touring car has under the hood a V8 3.9L twin-turbo that delivers 600 horsepower with technologies. The Ferrari Portofino is by nature elegant and has a facility to be noticed at the first glance. This exceptional Ferrari available for rent is a high-end model considered as one of the most practical in everyday life thanks to a safe that will be appreciated. It can accommodate suitcases or all your shopping purchases made on the French Riviera (Cannes, Monaco, Nice, St Tropez) or on your splendid holiday spot on the Italian or Spanish coast (Forte dei Marmi, Portofino, Marbella, Malaga). The presence of a ski hat ideal for you to go in the winter resort of your choice such as Courchevel, Megeve, Méribel, Val-Thorens, Chamonix-Mont Blanc … where the team of Rental Car Company will be delighted to answer your questions. expectations all season. Rent a supercar with 4 seats ! 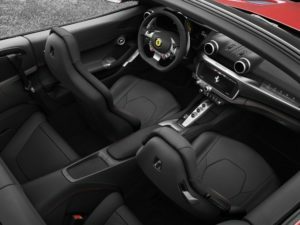 This sumptuous sports car has 4 seats, larger at the rear than its predecessor (the Ferrari California T) will be perfect for your walks with friends or with your children. This is the first Ferrari with a comfort criterion also present and improved. 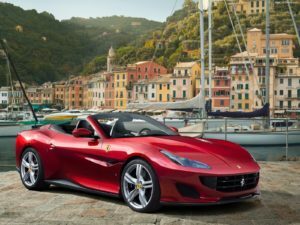 The new Ferrari Portofino is especially for you at Rental Car Company. This gorgeous Italian available in our rental company is composed of luxurious and upscale materials such as leather and carbon inside with a large central touch screen and a second for the passenger. The magnesium seats are completely new, the luxury finish inside this vehicle that you can drive where you want is exceptional. A carbon wheel with a magnificent rev counter covered with a prestigious glass as on luxury watches and two digital screens on each side, on the steering wheel you will find the start button with different modes of driving and a button allowing to manipulate the Ferrari suspensions to lower or elevate it, all with the classic controls present on all the wheels of the prestigious automobile brand. This new Ferrari will allow you to ride in a high-end sports car, but with a lot of comfort. It’s the perfect combination of luxury and sportsmanship. Outside you will be able to hear at the level of the exhaust a magnificent noise that will differentiate you from all. This Ferrari Portofino can be rented from Rental Car Company for short term rental during holidays, events (Cannes Film Festival, Monaco F1 Grand Prix 2019, Monaco Yacht Show) or seminars for the MIPIM or Cannes Lions, allows you to go from a very elegant convertible to a luxury sports coupe. The Ferrari Portofino is a convertible sports car that combines refinement and comfort to perfection. This model combines the unique characteristics of Ferrari, its finishes are an art and its materials are of irreproachable quality. Book now, rent this new Ferrari Portofino. Why rent from Car Luxury Agency ? Our company with many years of experience in the field of car rental with driver and without driver, makes every effort to satisfy our customers. Accessible to professionals and individuals, our agency specializes in high-end rental makes a point of honor to stay close to customers. The quality and customization of the service are our priorities. How to prepare your car rental? Whether you are on a business trip, a romantic weekend, a special event or a family holiday, choosing your rental car is essential. Book for self-drive hire car or the rental of a luxury car with chauffeur service. Renting a vehicle without a driver is often synonymous with freedom. This is an opportunity to enjoy the pleasure of driving a luxury car. Join the useful to the pleasant during your business trips for conferences, seminars or conferences becomes possible thanks to Rental Car Company. Offering a pleasant moment to your family, friends or friends, and renting a luxury car for your holiday, a last-minute weekend or a romantic holiday is a breeze. For the smooth running of a vehicle rental without driver, it is necessary to know all the elements. For any vehicle rental without driver, whether for vehicles SUV or 4×4, sedan, Van, cabriolet or sports, our company requires the customer to meet certain conditions. Before each reservation, our team of professionals ensure that the prospect fulfills the criteria. Every person wishing to rent a vehicle without a driver must present an identity document (national identity card, passport) and valid driver’s license. An international driving license is obviously accepted as well. To definitively confirm the reservation of a vehicle, our company requires a deposit of 30% of the total amount of the rental. This one is not refundable. The 70% remaining due will be paid at least 48 hours before the first day of rental. The customer must also make the deposit of a deposit at least 48h before the first day of rental. This deposit and blocked on a bank card and variable depending on the type of vehicle rented. In order to avoid the inconvenience related to the ceiling of the credit card, it is recommended to inform the bank beforehand. When traveling in an unfamiliar city, it is always better to be driven by a professional in the road. Choose an elegant, discreet and efficient passenger transport service. Our rental car rental company Car Luxury Agency offers private chauffeur service. Our employees are all bilingual English / French. It is also possible to ask when you book a car that the driver masters another language such as German, Arabic, Chinese, Spanish, Italian or Russian. During a provision of a vehicle with driver, the customer does not necessarily have a defined route. During the day, the private driver is always at the service of the customer, it tells the driver VTC where he wants to go according to his desires. The transfer service means that the journey is precise and predefined in advance. For example : shuttle between a hotel to an nice airport, or a trip from a port to a villa. When you have a chauffeur-driven car or a transfer, you will find inside the luxury vehicle an Iphone / Micro-USB charger, newspapers, cold drinks, sweets and tissues. Opting for a chauffeur service allows many benefits such as optimal safety on board, cost control thanks to a pricing defined in advance, the optimization of the road routes borrowed. Our car rental company with professional driver has selected qualified staff for its customers. All our drivers are holders of a VTC card (“transport car with driver“). Our company benefits from professional liability insurance. In which cities are we present? Which rental vehicle to choose? Among our fleet of rental cars, we offer you premium, high-end and prestigious car models. In our range of luxury convertible cars, you can rent an Audi A5 convertible, a Maserati GrandCabrio, a new Mercedes-Benz E-Class 2018 convertible, the Mini Cooper S convertible, or the Range Rover Evoque cabriolet. If you prefer a prestige sedan with or without a driver, we recommend that you rent an Audi A8, BMW 7 Series Limousine, a Mercedes-Benz S-Class, a Tesla Model S, or a Porsche Panamera. Experience the pinnacle of luxury when you rent a Bentley Bentayga or Lamborghini Urus SUV, an ultra-luxury convertible like the Rolls Royce Dawn or Bentley GTC, a limousine such as a Mercedes-Benz Maybach or a Rolls Royce Phantom or Ghost. Want to hire a 4×4 or an SUV? Book the BMW X5 (available in 7-seater version), the rustic Jeep Wrangler, the imposing Mercedes-Benz G63 AMG, a Mercedes-Benz GLS, or the new Range Rover Vogue or Sport. Do you have the soul of a sportsman? Rent a convertible sports car made by one of your favorite builder. The Ferrari 488 Spider, the Lamborghini Huracan Spyder and the Porsche 911 convertible, as many prestige supercars that will offer thrills. For the rental of a van-type minibus, we offer the luxurious Mercedes-Benz V-Class (available in 7 or 8 seats, in lounge mode or facing the road), the Mercedes-Benz Vito (formerly Mercedes-Benz Viano) and the Volkswagen Caravelle minivan.